Everyone deserves goodies. But a really great author who has entertained and captivated us with the emotional rollercoaster that is A Song of Ice and Fire deserves extra swag. Being the foodies that we are, we decided to make up a gift basket for George RR Martin when he started his book signing tour in MA. 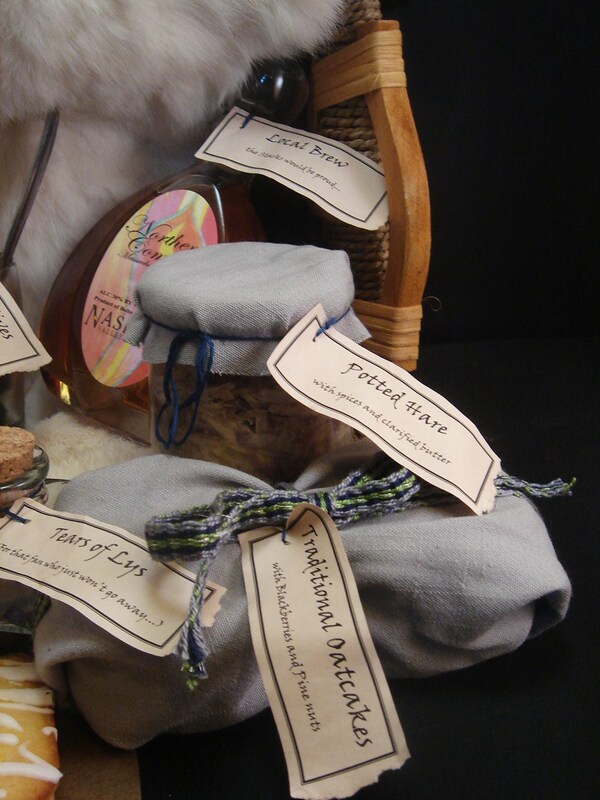 The swag basket included a medieval pork pie, cheese and olives, a small bottle of local cognac, traditional oatcakes with both blackberries and pine nuts, our new ultimate lemoncakes, potted hare, mulling spices, and our own little gag gift: a small bottle of “Tears of Lys”. 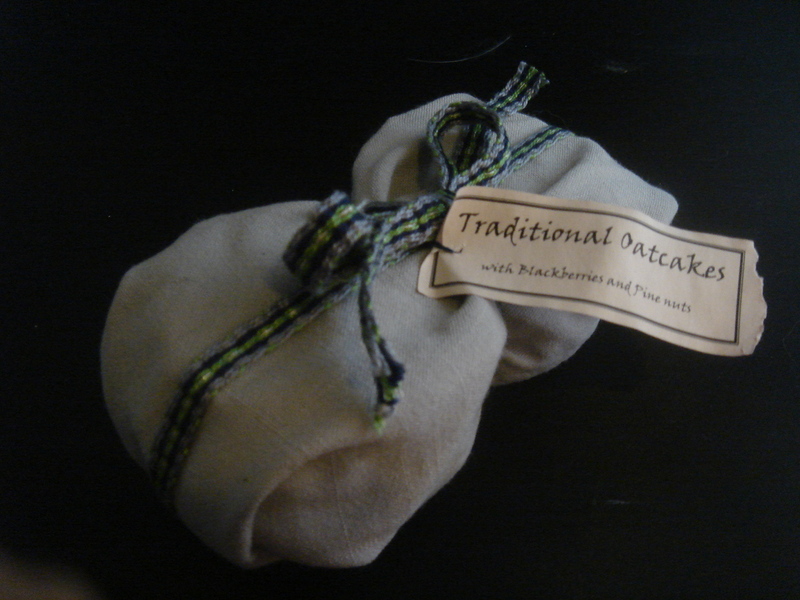 The parcels were wrapped in a combination of linen cloth and hand woven inkle bands before getting their individual labels. Into the basket, lined with leather and fur, for the perfect presentation. After Sariann finished work, we piled into the car with a couple of our Inn-mates (Ha! ), and headed for Burlington. At the bookstore, the lines were predictably around the entire side of the building, fans all abuzz with excitement about the new book and meeting George. We felt like superheroes in disguise wearing our snazzy aprons as the bookstore staff ushered us in and handed us off to the uber efficient Random House marketing folks, who in turn took us to The Martin. George was kind enough to take a few minutes to chat with us about food, and the contents of the gift basket. What a thrill! Congratulations to both of you! That’s great! Hopefully he enjoyed his food as much as we enjoy reading about it. I was about to say that if he wasn’t completely delighted with your basket, then he clearly has a heart of stone. Then I remembered he’s King of Dead Main Characterland, so the heart of stone is kind of a given. But by golly he SHOULD have been delighted!!! Love the aprons!!! The food basket looks AMAZING! So lucky that you guys got to meet George Martin (and does he know how fabulous your guys’ blog is???)! Well done. The spread looks wonderful! Awesome! I know that GRRM knows about this blog because I found it from HIS blog! Anyway, well done! Great share! 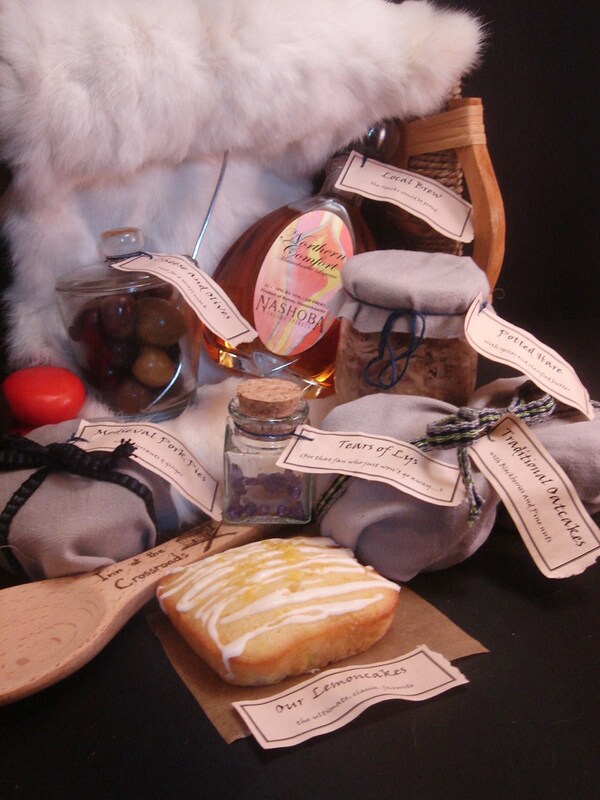 Looks amazing and REALLY hope you make more goodies and baskets for all the Song of Ice and Fire fans in the world; you NEED to open your online business so ALL OF US CAN ORDER the treats and send gift baskets to others. The food looks scrumptious, the packaging fantastic and special fun item like Tears of Lys total genius. At the very least, specialty items limited quantities and gift baskets for book signings, conventions, HBO screenings/premieres/parties….do it do it do it!!! the gift basket looks amazing, well done! That’s great! I was looking for you two but alas I was in the back of the line on behind the building for over 3 hours. Hi! I was at the Union Square BN for the signing. Unfortunately I was part of the standing room only crowd, so didn’t get a chance to see you guys up close. Congratulations if your cook book get published. Congrats on the book! How did that come about? Did Ann Groell contact you, or did you contact her and pitch it? You’re doing a cookbook? When? Where?? How?? And when can I buy it??? I assume you have finished Dance with Dragons by now? Puts a bit of a twist on one of the items in that basket!